These rules are meant to be followed. Ignoring those rules in any way will result in consequences which we determine situational. 1. No backstabbing - Killing a member of your clan during a clan event will result in a kick from the clan if the items are not returned. 2. No flaming in our Clan Chat - Any problems you may have with another clan member should be solved in discussion limited only to your eyes. Half of the clan often doesn't care. 3. Listen if a clan member with a higher rank tells you something - if you broke a rule or are generally obnoxious in the clan chat or during events, a clanmember with considerable power may call a more orderly attitude from you. You should follow those tips. 4. Offical Clan Chat language is English - Keep it English in the CC to avoid confusion. You can always PM someone. 5. Add Clan Leader and Clan Co-Leader to your friends list - If we need to contact you on any reason, you should enable us to see you online. 6. Be on as many events as you can - Since we are a PK-oriented clan, we expect our members to attend AS MANY EVENTS AS POSSIBLE. People who do not attend our events are inactive in the eyes of the leaders and therefore useless to the clan. If we announce a PK trip and see you online in our world and you do not attend the event, we will take action. 7. Dont break any other Runescape rule - This is self-explanatory. 8. 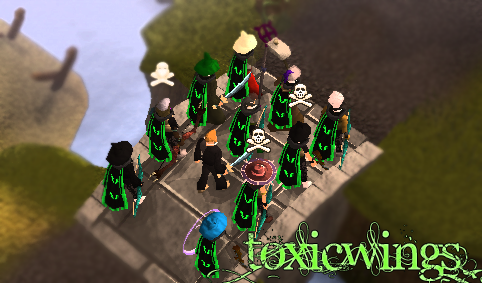 Wear clan cape/Green fremennink hat at every pk trip/event/war - Can't stress this enough.. PLEASE USE A CLAN CAPE ON CLAN PK TRIPS TO AVOID GETTING LEFT-CLICKED OR ATTACKED. People do not check minimap at all times and unfamiliar names might get knocked out. To avoid this, please wear a clan cape. 9. Listen Trip Leader/War Leader at events! - Clan leaders and trip leaders are often very experienced people when it comes to PKing. Following their instructions on a PK trip will result in a more powerful team and gets us more kills without many deaths. 10. NO TELEPORT AT PK TRIPS/CLAN WARS! - This rule is becose before meeting hudge amount of enemys, many member will teleport and others will have to die, respect ur clan mates and dont bring teleport or be kicked from the clan! 11. Join our TeamSpeak 3 channel - http://toxicwings.forumotion.com/t36-downloadingconnecting-teamspeak Guide how to connect, download. Clan Rules updated at 11.12.2011! 2: no begging for cash or any other product. Thanks for advice, ill talk about rules with vajina. 8. Wear clan cape/white bandana at every pk trip/event/war - Can't stress this enough.. PLEASE USE A CLAN CAPE ON CLAN PK TRIPS TO AVOID GETTING LEFT-CLICKED OR ATTACKED. People do not check minimap at all times and unfamiliar names might get knocked out. To avoid this, please wear a clan cape. Clan Rules Updated at 29.01.2012! Subject: Re: Rules of clan !